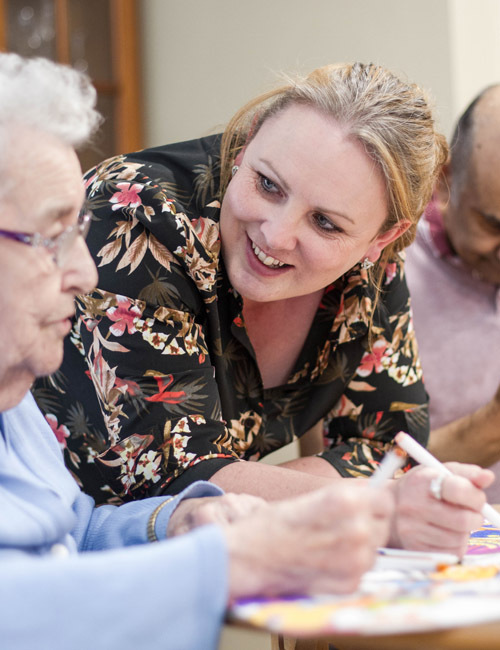 At Elcombe House in Bedford, we provide specialist residential care for people with dementia, both the elderly and the under-65s. Our care is person-centred. That means we treat every resident as an individual and do our utmost to accommodate their personal requirements. You won’t find our staff wearing uniform because we believe that everyone here is equal – we’re all part of one very large extended family. Elcombe House is in a Victorian property and feels like a proper home-from-home. New-build places often come with a confusing array of corridors leading to shiny-new rooms that appear cold and alien. Our home is quite the opposite, offering a warm and cosy familiarity to residents, who are able to walk freely around the place whenever they please. The home is made up of 22 bedrooms, the majority of which come with an ensuite toilet and sink. On the door of each room is a poster with the resident’s name and a selection of personal photos. Elcombe House also has a large open-plan lounge and dining room that overlooks the garden, a second lounge, two separate bathrooms and a small kitchenette that can be used by both residents and visitors. Bedford Park is a short walk away, and the home is also very close to the town centre with its shops and restaurants as well as the local hospital.